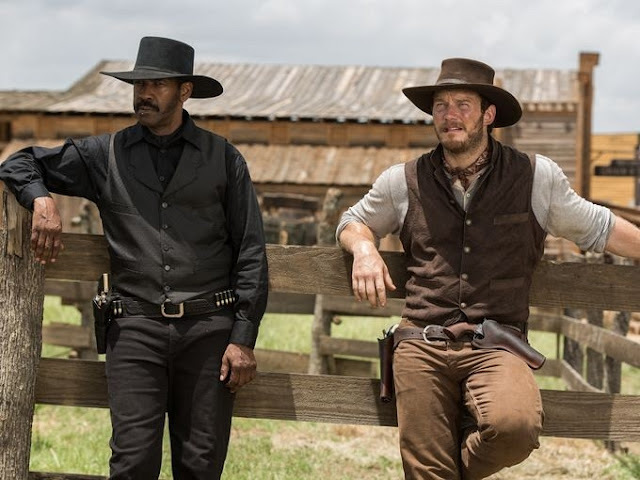 Director Antoine Fuqua brings his modern vision to a classic story in Metro-Goldwyn-Mayer Pictures' and Columbia Pictures' The Magnificent Seven. 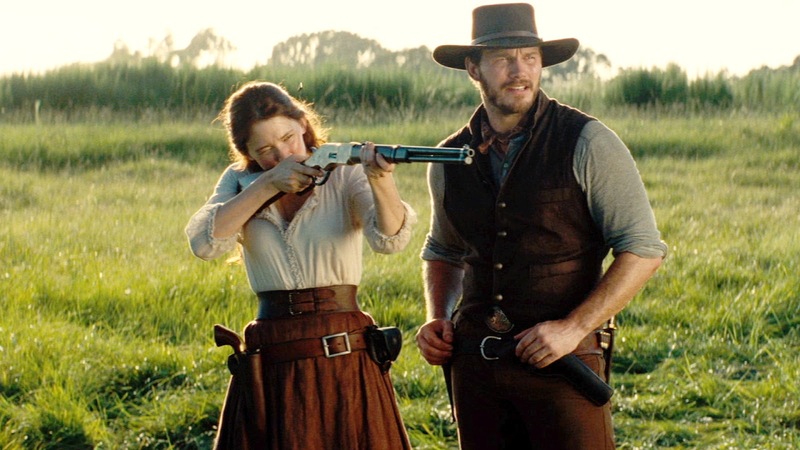 With the town of Rose Creek under the deadly control of industrialist Bartholomew Bogue (Peter Sarsgaard), the desperate townspeople, led by Emma Cullen (Haley Bennett), employ protection from seven outlaws, bounty hunters, gamblers and hired guns - Sam Chisolm (Denzel Washington), Josh Farraday (Chris Pratt), Goodnight Robicheaux (Ethan Hawke), Jack Horne (Vincent D'Onofrio), Billy Rocks (Byung-Hun Lee), Vasquez (Manuel Garcia-Rulfo), and Red Harvest (Martin Sensmeier). As they prepare the town for the violent showdown that they know is coming, these seven mercenaries find themselves fighting for more than money. THE MAGNIFICENT SEVEN BEGINS PLAYING IN U.S. CINEMAS ON THE 23rd OF SEPTEMBER AND IN MALAYSIA ON THE 22nd OF SEPTEMBER. TO FIND OUT WHEN IT OPENS NEAR YOU CLICK HERE. So last night I went to watch The Magnificent Seven which is as of this writing is still a full three days before it officially opens in the U.S. There's been a fairly good buzz around this movie and that's probably due to the fact that this movie has to live up to two movies from the past. One shares the same title, the second is the original movie that spawned the previous film with the same title. Let's begin with the original source, Seven Samurai (1954) by Akira Kurosawa. Co-written, edited, and directed by Akira Kurosawa the film has been lauded ever since it's release and has influenced movies and directors ever since. Seven Samurai was the first time that anyone saw a story where a someone a person or village in need goes in search of someone to help them and who himself goes in search of others to help him. We now see this narrative in almost every other action movie. But that's not the only narrative influence that Seven Samurai has left, there's the introducing the main hero with an undertaking unrelated to the main plot, the reluctant hero, romance between a local woman and the youngest hero, and the nervousness of the common citizenry had appeared in other films before this but were combined in this film. Seven Samurai was also one of the earliest films to successfully use the telephoto lens which was rare in 1954. It was also the first time that any director used multiple cameras to film a scene which allowed the audience to be fully immersed in the action without having to have the actors repeat what they were doing. Seven Samurai was a creative and technical accomplishment unlike any other for that period and became Japan's highest-grossing movie and set a new standard for the industry. Six years later came The Magnificent Seven. Directed by John Sturges and starring Yul Brynner, Steve McQueen, Horst Buchholz, Charles Bronson, Robert Vaughn, James Coburn, and Brad Dexter. 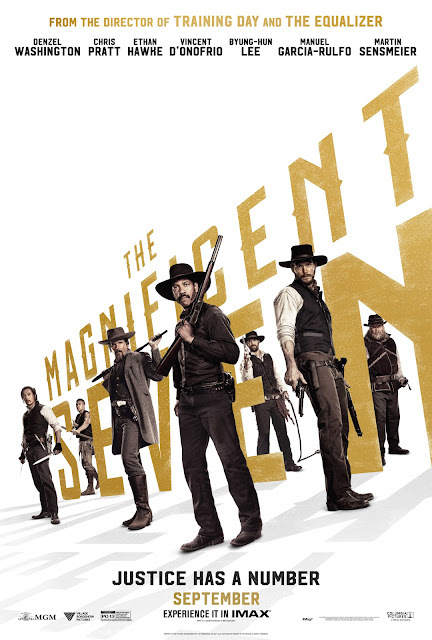 The Magnificent Seven adapted the Seven Samurai story and characters and placed them in the old west, replacing the samurai sword with guns and rifles. The film even took whole scenes and replicated it in the old west. Unfortunately, instead of being a successful adaptation of Seven Samurai meant to entertain a western audience when it was released, the critics hated it. But there is one person who liked it so much that he gave director John Sturges a samurai sword, Akira Kurosawa. 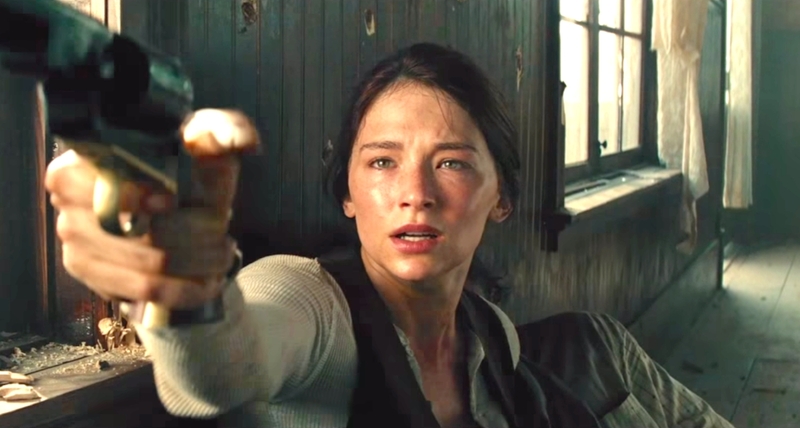 So now 62 years after Seven Samurai and 56 years after the original The Magnificent Seven and countless other movies that have been influenced by it or made variations of the narrative comes Antoine Fuqua's version. You'll remember Antoine Fuqua for exciting, tense and gripping action dramas such as Southpaw (2015), The Equalizer (2014), Olympus Has Fallen (2013) and Training Day (2001) which gave Denzel Washington his first Oscar for Best Actor in a Leading Role and Ethan Hawke a nomination for Best Actor in A Supporting Role. The film stars Denzel Washington as Chisolm, Chris Pratt as Josh Faraday, Ethan Hawke as Goodnight Robicheaux, Vincent D'Onofrio as Jack Horne, Byung-hun Lee as Billy Rocks, Manuel Garcia-Rulfo as Vasquez, Martin Sensmeier as Red Harvest, Haley Bennett as Emma Cullen one of the folks from Rose Creek who goes in search for heroes to help her and Peter Sarsgaard as Bartholomew Bogue the evil robber baron who has taken over Rose Creek in order to mine gold in the nearby hills. So here's a list of things I like. The story is of course familiar but in the hands of Fuqua it's executed pretty good and in a goodly pace. A nice blend of everything. A well balanced treatment of all the cast. Yes, Denzel Washington and Chris Pratt are the headliners but everyone gets enough time for you to get to know them without feeling like it was done without thought. The visuals are pretty good. Fuqua style is present but he pays tribute to the old ways too which you'll notice with the extreme close-ups of the actors to capture their expression. The acting. If you enjoyed Denzel's work in his past films with Fuqua you'll enjoy it here too. Chris Pratt is entertaining and funny. Hawke is good. D'Onofrio is quirky. All in all the cast works pretty well together and is entertaining. Peter Sarsgaard is delightfully evil and hateful without going over the top in my opinion. The things I wasn't so impressed with. The big fight scene at the end. It seemed to run a little too long and loses some of its momentum after a while. And that sort of ruins the whole climactic pace/feeling at the end. So there you go. I enjoyed The Magnificent Seven. It's not a masterpiece and I can't say if it does any of it's predecessors justice because I don't remember much of them but it's a familiar story told by a director who is more than capable of delivering a good story filled with equal amounts of tension, drama and action. Basically if you've enjoyed Fuqua's previous films you'll probably enjoy this one. And if you've enjoyed Denzel's work when he collaborates with Fuqua then you'll probably enjoy him in this too. 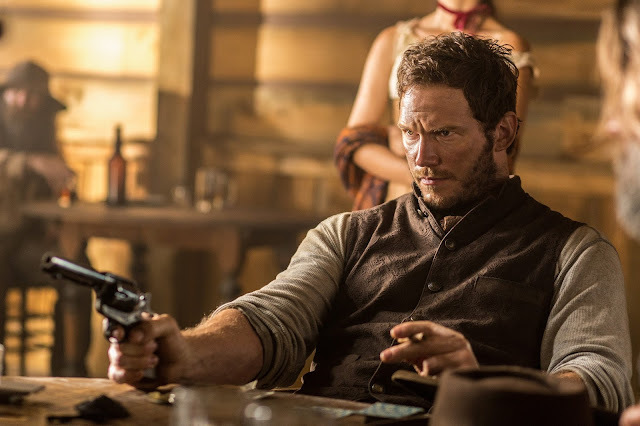 If you love Chris Pratt then you'll probably like what he does here too. It's a decent maybe even good action movie with a nice amount of drama. So I'm giving The Magnificent Seven a decent 3 out of 5. Check out the most recent trailer below. BIG THANKS TO KLIPS.MY AND SONY PICTURES MALAYSIA FOR THE PREVIEW PASSES!